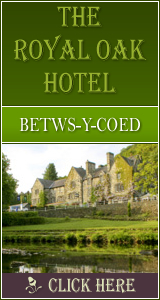 Barmouth: Accommodation, Attractions, Activities, Going Out, Shopping, Things to Do, Places of Interest, Outdoors, Llandudno Holidays, Llandudno Area Location, North Wales. Barmouth is a town in the county of Gwynedd, north-western Wales, lying on the estuary of the River Mawddach and Cardigan Bay. Barmouth is a seaside resort, with notable buildings like the mediaeval Tŷ Gwyn tower house, the nineteenth century Tŷ Crwn roundhouse prision and St John�s Church. Barmouth also has a new Lifeboat Visitors� centre where visitors can purchase souvenirs and take a look at the RNLI (Royal National Lifeboat Institution) lifeboat from the viewing gallery. The busy harbour also hosts the annual Three Peaks yacht race. There are miles of great walking, climbing and cycling routes in Barmouth, with a variety of unspoiled countryside and coastline. The terrain includes valleys, open moorland, lakes and mountains, with disused railway lines, old miners� and drovers� trails to follow. The area hosts and abundance of wildlife, perfect for birdwatchers, and there�s even the chance to spot porpoise, seals and Cardigan Bay dolphins. If you enjoy cycling, you can either bring your own or hire one when you arrive. There�s beautiful scenery to enjoy cycling alongside the estuary. There are miles of sandy beaches (awarded the Blue Flag), boat and freshwater fishing, hill walking, a variety of shops, a selection of hotels, caravan and camping sites, a theatre, pubs and clubs, a market, nearby golf courses and a funfair during the summer.